MAUI KAMAOLE- - Professionally decorated by a noted San Francisco designer, you will feel the relaxing atmosphere of 'Magical Hawaii' with the Newly remodeled interior surroundings and 23 acres of lush flower gardens .This is the last phase of Kihei's PREMIER PROPERTY . This bungalow style, low-rise, low-density property is across from Maui's world class beach Kamaole III, written up in Sunset Magazine. Just to the left is lovely Kaewakapu beach. The romantic site of several islands is available form both beaches. Stretch out in this rare unit- wider then most ,which is all ground floor, and no stairs. Enjoy cocktails and dinning on our extra large lanai and listen to the bird songs while you view the tropical gardens. LOCATION --We are one minute to the exotic waterfall pool ,tennis courts ,short walk to Kamaole III beach , the boat harbor , and Keawakapu beach. You can also walk to casual or elegant dining and shopping. Enjoy the peace and quiet of this location (no street noise or view of Kihei Rd.). Close to two swimming pools - one with a tropical waterfall, tennis courts, and long sheltered beach. You can stroll on Maui's most beautiful white beaches - to the Grand Wailea Resort and additional fine and casual restaurants. World class golf courses are everywhere. We are right next to the WAILEA border. Home Amenities: ground floor, extra wide unit ,newest building and designed with wide hallways, and huge kitchen . Large master bedroom suite with private tropical lani, two double closets, huge red bathroom with 2 basins and large counters. Bright and cheerful smaller den guest room with queen bed and adjacent bath with walk in shower with shower heads for adults and children. Separate state of the art quiet air-conditioners for each bedroom and living room. Free convenient parking , free new high speed wire less internet, full equipped unit (like home) including with washer and dryer. We have all of the beach equipment and beach toys ,even life jackets for little ones and cooler. 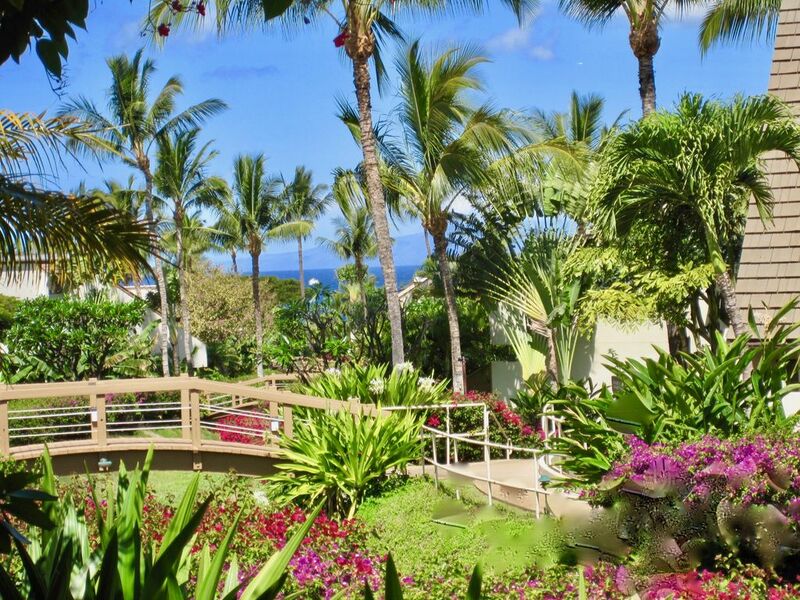 We all love to have cocktails and dinner on the large lanai enjoying the view of the tropical flower garden downhill towards the Maui sunsets while listening to the birds. We have front desk to check you in and a great management company right there to see to all your needs. We do everything to make your stay convenient and comfortable . We are hear to please, just ask.. So what are you waiting for? .Book early for the bests dates. Magical Maui is waiting. Key words: Master suite & Den guest room 2 queen beds and sofa sleeper--- ALL Ground floor, bungalow, beautiful professionaly designed interior with large tropical lani and lawn beyond.
. I loved the property and the potential of these new units the minute I saw them. I was born in Hawaii, and this vacation home feels like home to my soul. My family were early settlers in Maui. My grandfather was the overseer of the Lahaina sugar plantation. We all have a great love of this beautiful island. I chose a place like the gorgeous Maui I remembered. It is one of the most beautiful lush tropical properties on the island with a small boat harbor for trips to snorkrel and canoe.just across the street. . The beach to the right, Kamamaole III is perfect for families . It is a long and wide sheltered white sand beach. It has park with picnic tables, shade trees, bathrooms and life guards. It has fabulous sunsets. whales .and Islands. Walk to restaurants, shopping and ice cream and much more . The beach to the left, Keawakapu beach is one of the most beautiful anywhere with views of islands . volcanos, and whales and you can walk or run to the famous hotels- Grand Wailea , 4 Seasons and the Fairmont .
. I liked the bungalow style units and all the tropical flowers and trees. We used to stay at the Grand Wailea Hotel, but when I saw these new units up on the lovely knoll, I knew I had found a place I could put my Interior Design skills to work on my Maui home. The two pools in convenient areas. This unit's pool is the beautiful upper waterfall rock pool with hot spa and an entertaining area poolside with tables, umbrellas and sheltered out door seating and eating area. The condo is extremely well planned and beautifully furnished in grand Hawaiian style. I personally selected furnishings and art from around the world and sent it over in a container. My kind guests have written many generous compliments in my guest books in the unit . Maui Kamaole property is across a 2 lane road to beach front and a boat harbor. My unit is about a 5-7minute walk depending on who's is walking. My 4 and 5 years olds do it. Maui Kamaole property is just Across from the beach which has no building on it. Its is a 5 to 7 minute walk the beach. Built in air throughth out with separate controlls in bedrooms. beach equipment , towels, bogy boards, buckets w/toys ,etc -- life jackets small to big sizes. World class Golf, Whale watching,volcano bicycle tours,moon light sailing, snorkeling ,live theater, ziplining, Grand Wailea Hotel.